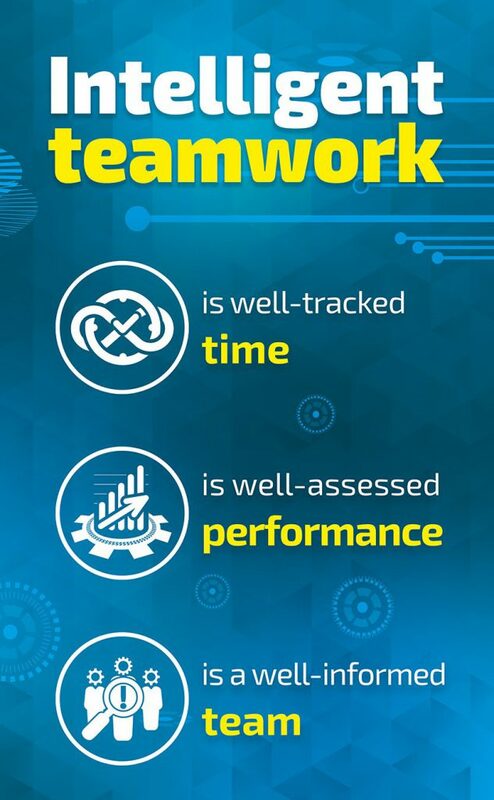 Checklists are said to be the key to a successful transformation of any business. A simple solution that is surprisingly effective in making our lives simpler and our work more productive. Checklists reduce errors and ensure consistency in carrying out tasks as well as help us remember about important points and issues. They may contain any essential data regarding our accomplishments or plans. 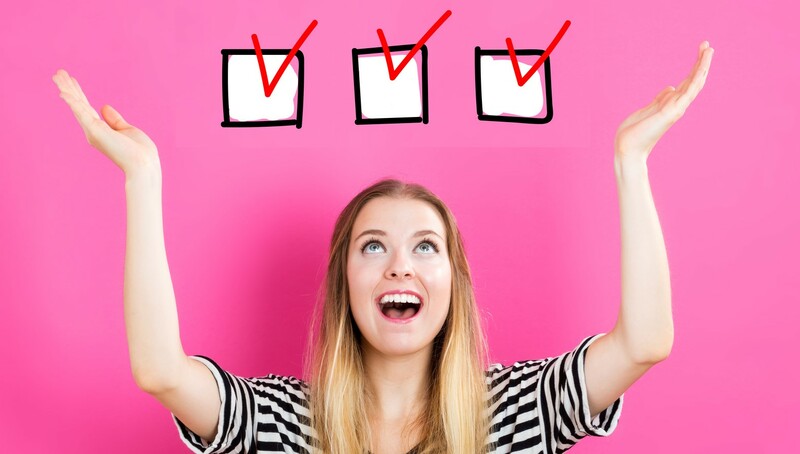 Due to their versatility, checklists can be beneficial in any industry. As checklists are great tools to carry out compliance checks and collect data in an orderly and systematic manner, they prove themselves in more complex workflow perfectly. Hence, they can be successfully used to organise development processes. Agile teams highly appreciate the implementation of lists as acceptance criteria solutions, definition of done or progress tracking tools. They especially prefer to take advantage of checklists in project management tools such as Jira. This type of software is highly recommended to keep the workflow organized and enables the team to see other stuff present in the working environment. Everyone using Jira realises it is a phenomenally powerful project management software. However, there are occasions when it cannot be bent to meet our specific custom-functionality. If your company uses Jira to plan and track work, you surely come across issues including tasks to complete, often hidden among comments or impossible to understand because of endless descriptions. Yet breaking down an issue into Jira subtasks still may seem too complex. Luckily, Jira’s greatest strength is the fact that it can be customized at every level. It has an enormous library of add ons that offer almost any functionality one can think of. One of the newest apps in the Atlassian Marketplace is Multiple Checklists for Jira by SolDevelo. It allows you to break up bigger tasks, monitor stages and create useful templates. By introducing this tool in Jira, we aim to help you organise your work better and let all team members see what needs to be done and when it is complete. Multiple Checklists for Jira are perfect for issues that need to be broken down into smaller steps. This app offers its users a bunch of capabilities including the creation of acceptance criteria, definition of done and other ToDo lists. It helps in working on a particular task, divide tasks into items and mark their realization as you complete them. It’s a kind of useful organizer, built-in in your JIRA, and at the same time our answer to a growing demand for implementing checklists within project management tools as an integral element of workflow organization. With the help of Multiple Checklists for Jira you can extend the features of Jira to build smart checklists that will enable your teams to get things done faster. Break down large tasks into smaller actionable items that are required to complete an issue. Everyone enjoys the feeling of marking a checkbox as done, don’t they? A checklist is a way of keeping track of subtasks within an issue. It ensures that all actions required to complete the issue are not forgotten and taken in a systematic way. With Multiple Checklists for Jira you can reorganise and reorder checklist items as necessary. When your work on a particular task is completed, delete the items that are no longer needed. You can simply tick off the things that are finished and get immediate insight into what still needs to be done. Multiple Checklists for Jira enable project managers to control their team’s work as well as their employees productivity. One of the best things about this app is that it can help avoid confusing scenarios when a task is assigned to several employees. 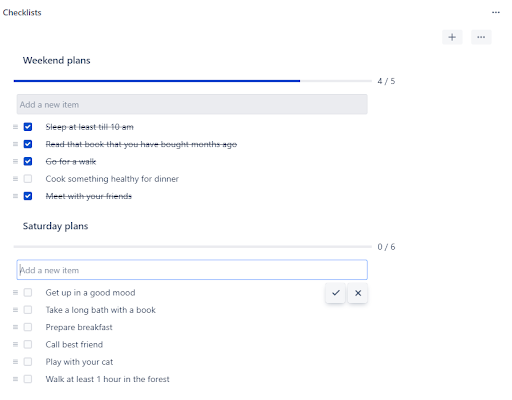 When you create one task and assign that task to a few different people, you can add a checklist to your task description for workload clarity. When an employee finishes their job, he or she should go to the checklist within the task to indicate that their portion of work is ready. When everyone has checked off their separate line items, a project manager knows everyone finished their job and the entire task is completed. When tasks have multiple components, it can be challenging to track what has been completed versus what is still in progress. It is especially confusing when different segments must be completed by different people. Having all the segments written down as a checklist ensures that no team member misses a single point. Thanks to the dedicated progress bar you can track progress in each checklist. It gives you a clear overview of the tasks that have been done or that still need to be completed. Thanks to Multiple Checklists for Jira you can save any checklist as template and later modify and adjust it as needed. Working with templates is convenient. 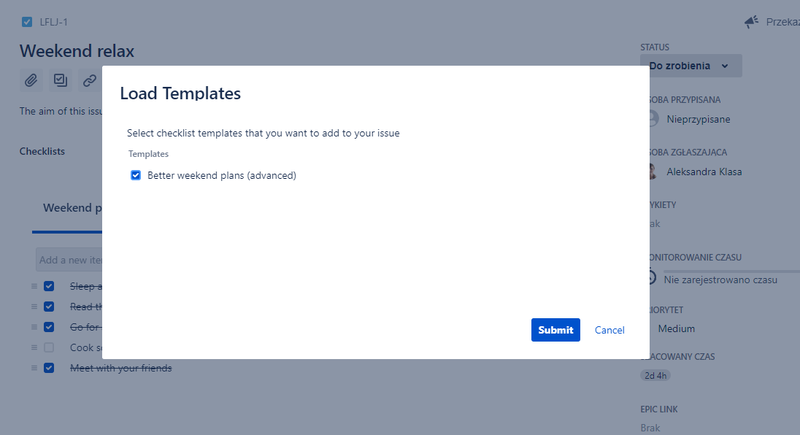 With little effort, you can prepare useful templates and upload them to any selected issues. It is a great solution for repetitive sets of tasks or requirements. That can save you a lot of energy, can’t it? It means that you don’t have to reinvent the wheel every time a task appears, and instead you can follow something that was already developed before. For example, you can save the Definition of Done as a template, to re-use in any further issue. You can easily configure your project to have the Definition of Done checklist added to any created issue. Another great feature of our new app is assigning checklists templates to selected issue types within projects. It allows you to relieve your memory even more! Now the most universal checklists will always add automatically to newly created issues. You don’t believe it? Try and assign definition of done will to your new issues based on a project and an issue type. You can as well automatically add your “Definition of Ready” checklist to each new issue in Jira and track the progress on getting them ready for development. All is set! Multiple Checklists for Jira allows you to create as many checklists in single issues as you need. You can name or rename any checklist in the most suitable way so it is easily distinguishable and does not cause too much confusion. You can freely add and edit new checklists to an issue and retain a high level of organization in your to-dos. The only thing you have to do is to open an issue and start writing a checklist. It’s as simple as that, isn’t it? We all know that overlooking one critical step in the project development process may prove damaging and harmful to the whole team. Checklists are the real saviours here! They help you become more productive because you don’t need to use time remembering the steps and as a result you can dedicate all your time on doing the task. Multiple Checklists for Jira can be a alternative to subtasks that are not always suitable to use in a particular issue. Using our app can improve your performance and help you achieve more consistent results. With their help you don’t miss the obvious in the frenzy of many things swirling around us in our workload.